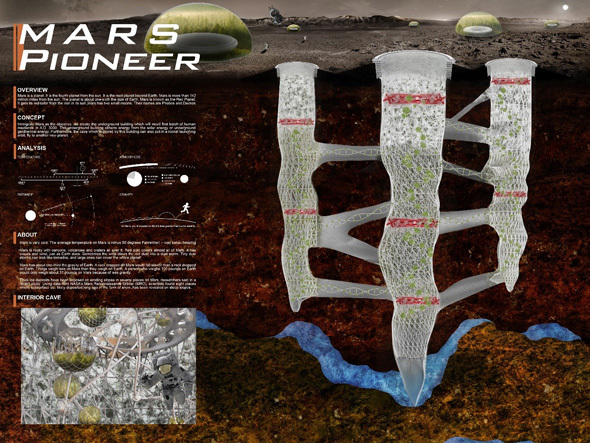 Immigrate Mars as the objective, we create the underground building which will move first batch of human residence in A.D. 3000. This underground building obtains energy from the solar energy or underground geothermal energy. Furthermore, the cave which explored by this building can also put in a rocket launching orbit, fly to another new planet. Ancient Huizhou Building is located in the mountain. We place the skyscraper in Yellow Mountain, which is famous for its pines, sea of clouds. 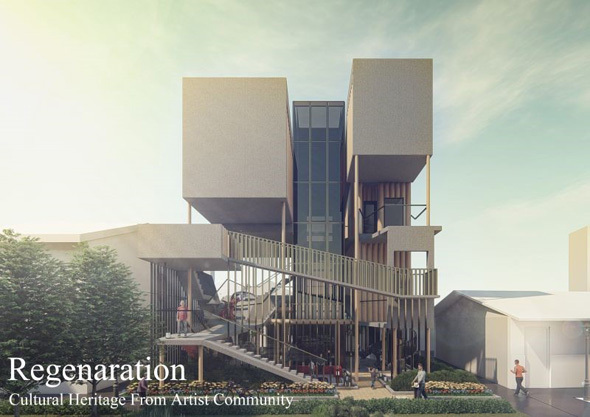 Starting with gather and reside as the design concept, Huizhou Architectural culture center, the skyscraper full of regional culture, will strengthen the modern people’s attention to the tradition. In this project, we have integrated the important elements of Huizhou ancient buildings, such as Ma Tau wall, window grilles, gatehouse, patio, etc. 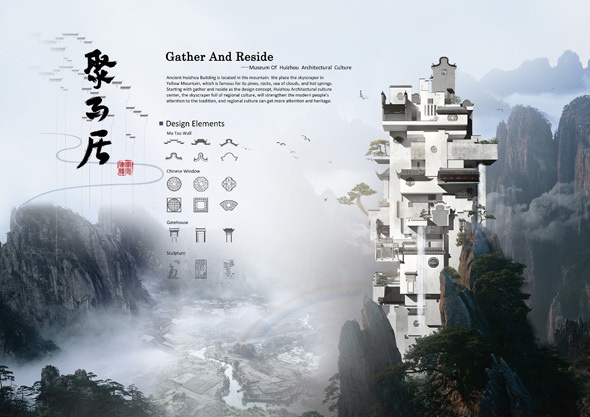 to the stack combination in vertical height, remodeling a vibrant and commemorative Huizhou Building System. Each year , 1,000 or more people die in the war because when military conflicts between two or more organizations. The idea of building is originated from China’s traditional skills – Luban lock. "Luban Lock" is a three-axis combination of building blocks, the six groups of the most common and six different blocks combined with each other into a square. 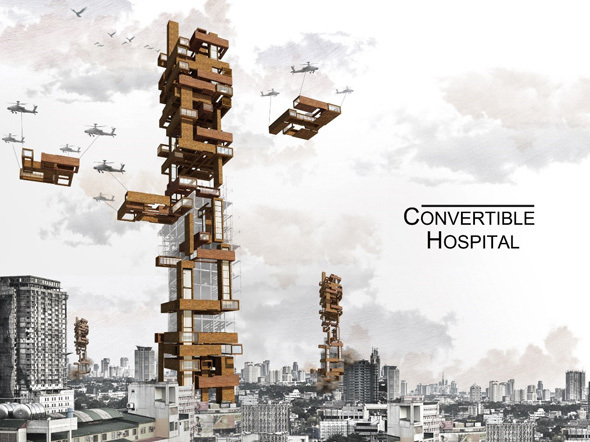 When the war happened , In addition to downsizing the entire building to below the ground, building blocks can be quickly remove and be shipped by helicopter to the surrounding areas and become emergency room to extending patient lives. We intend to design a low tech style space. All walls and floors present both artificial and unartifial to show more ambiguous. We hope to adapt the power of "Zen" to show serene,solemn,great atmosphere. We expect travelers can experience the contrast with fine light and stream. People should impress by the art of eternity serene through time and space. And then they release themselves from daily tight schedule. 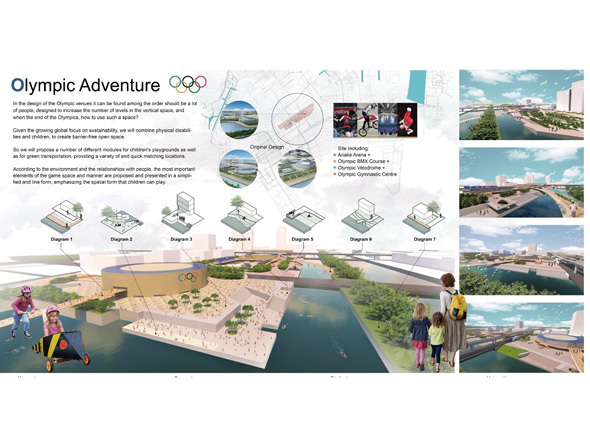 After observing the local buoyancy carrier, we designed a combined floating apartment. Use local building materials "bamboo". Combines natural ventilation design confrontate the hot tropical areas. 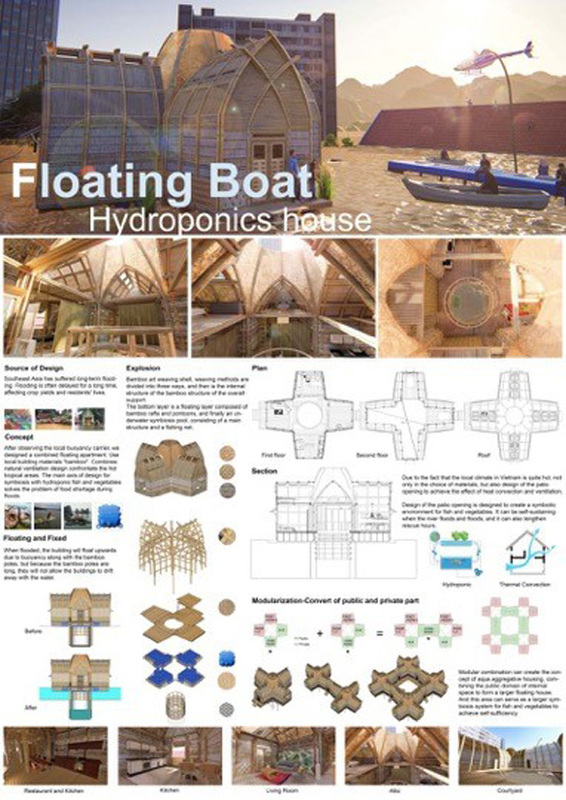 The main axis of design for symbiosis with hydroponic fish and vegetables solves the problem of food shortage during floods. Rural house in Chinese was built for hundreds years. However, according to the regulations, the rural house can’t become the Declared Monuments. As the owner pass away, the rural house was abandoned. In order to use the rural house again and make it alive, we reserve the original culture and elements as well as use the modern architecture technique. Resident artists are invited to stay to bring new culture and vitality here. The old cultural factors and the artists fuse the new culture and promote a new blossom in the community art and culture. Because of the extreme climate, wildfires become increasingly common and fatal to forests in many countries. It has caused a lot of damage and killed in recent years. Due to this problem Hexagon Rainmaker Drone has designed to improve this situation. 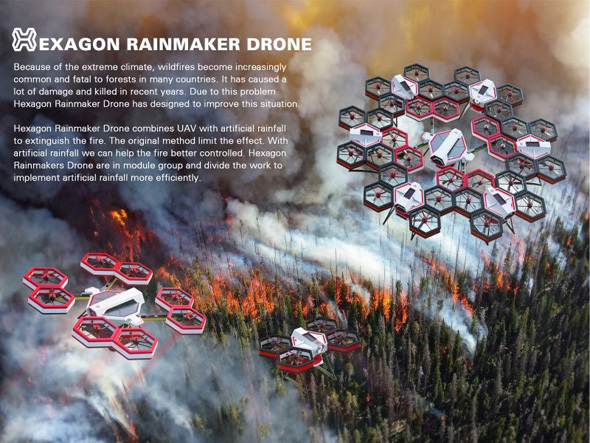 Hexagon Rainmaker Drone combines UAV with artificial rainfall to extinguish the fire. The original method limits the effect. With artificial rainfall we can help the fire better controlled. Hexagon Rainmakers Drone are in module group and divide the work to implement artificial rainfall more efficiently. 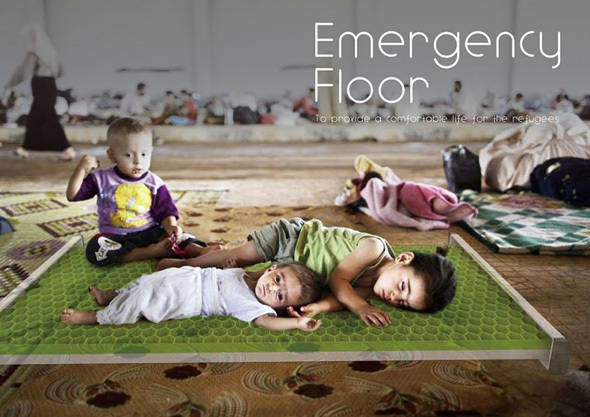 Emergency Floor use the design of the honeycomb flaps can drasticically reduced the volumes.Composite materialcan increase comfort. The lower layer of the honeycomb structure made by recycled paper. The shell is equipped with solar panels and temperature display. Increase the thermostat to adjust the temperature. Metal sensor has heating and radiating function The thermostat makes people more comfortable, and prevent hyperthermia or hypothermia. Nature environment is suffering high pressure cause lot of factories and resident houses appear as people developing science and technology. The concept comes from the component of cells. 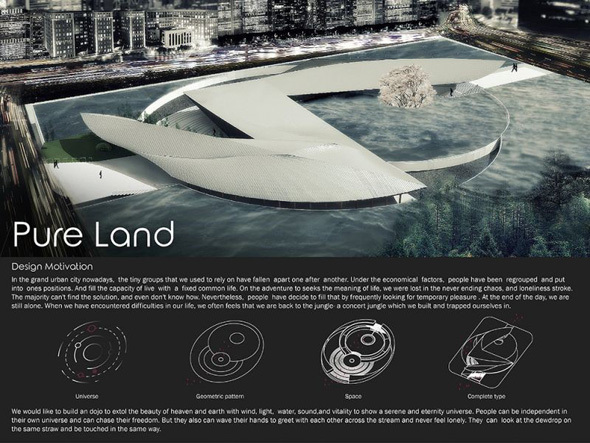 Different components have individual effects and works, which build up a building that works like creature. Like cell controls in and out of materials, the building is to become the protection of earth. 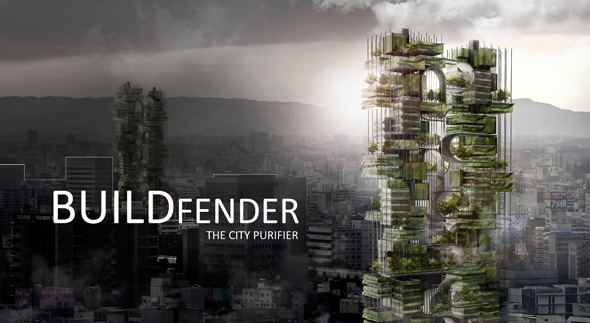 Pollution will be limited inside the building itself, while stopping destroying nature, it also purifies our environment. The skyscraper that moves like beast in the desert is in settlements to maintain Bedouin habitual way of life. It has vertical grazing pastures and many reliable sources of water source. It is not necessary to abandon the traditional way of improving the quality of life. 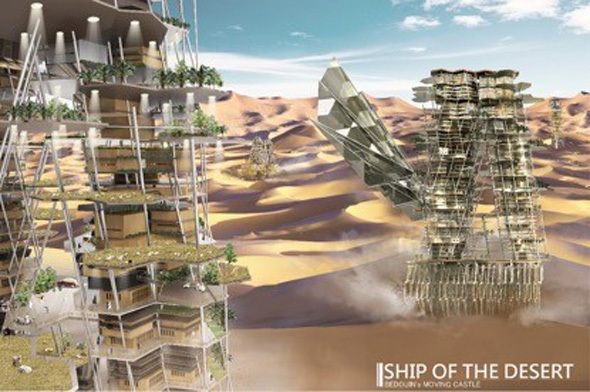 By combining mobile creatures and skyscrapers to create a vertical settlement that can move along with climate and water give a stable quality of life, a reliable source of water and pasture grazing for Bedouin. Due to the expansion of landuse requirement, our living spaces gradually covered with high-rise buildings, however in contrast, nature environment decreased by time. High density of buildings cause air pressure which is huge and easy to be got. If we can use this power with a more efficient way, we may release the pressure and destroy to the environment. 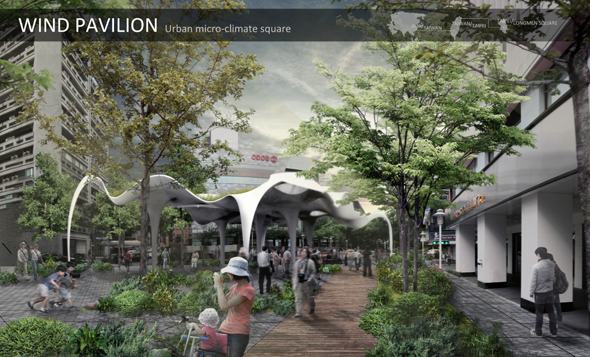 Besides, the urban square provides intelligent natural resources cycle system and combines the design of water, light, wind and temperature, allows people having a comfortable public space. To prevent the problems of walking the dog, we separate the pathway of the owner and the pet. The pet can drown anywhere in their area, and the excreta can be used as nutrition. In the pet area, we provide several kinds of facilities for the pets to play around in which are providing exercises for their health at the same time. This type of soil decomposes fungus in twice the speed of normal soil, therefore the smell and bacteria from the fungus can be decomposed quickly. The soil turns the excreta to nutrition, which benefits a large area of soil, and the plants will grow better. Given the growing global focus on sustainability, we will combine physical disabilities and children, to create barrier-free open space. 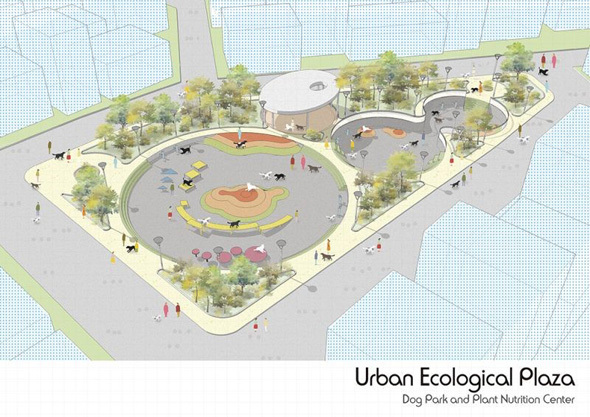 So we will propose a number of different modules for children’s playgrounds as well as for green transportation, providing a variety of and quick matching locations. According to the environment and the relationships with people, the most important elements of the game space and manner are proposed and presented in a simplified and line form, emphasizing the spatial form that children can play. 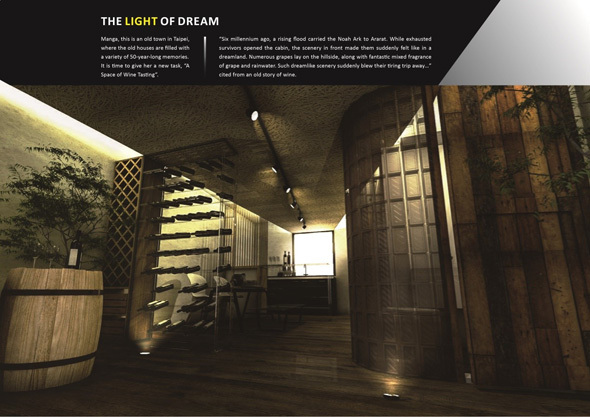 Bringing the ancient story “the origin of wine” into the internal space is the main idea I am pursuing, and, meanwhile, making the space no longer just simply a “wine retailer”. Let us travel through the time together back to the Noah’s age, and to feel the touched moment that people on the ark who were just finding a hope in desperation. In this long and narrow 32-meter square space, the only light source is the window which placed at the end of corridor. By guiding the light coming through ceiling’s intervals, leading people to see the dreams and hopes. Using the classic game "Tetris" as the basic element. To create a dream world that belongs to children, not only includes the idea of having fun, but also introduces programs of "teaching" and "family activities" to achieve a multi-functional effect. The whole building is a parent-child hotel, a teaching space and a recreation paradise, so that the children can learn together with their families in the joyous world, which not only increases children’s learning desires but helps to narrow the intimacy between parents and children. In the future, global warming caused iceberg melt and sea level rise, so many cities will disappear. It will shrink open space on earth. 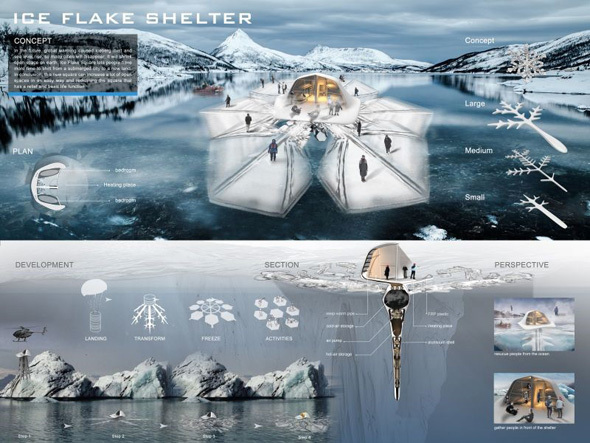 Ice Flake Square lets people have more time to shift from a submerged city to a new land. In conclusion, this new square can increase a lot of open spaces in an easy way and redefining the square that has a relief and basic life function. 登入 | 60 queries. 0.116 seconds.